You can get a useful view from Amazon's Search Inside which has the cool Surprise Me feature. The Preface will give you a sense of the over all design, but for a bread-and-butter accounting for the topics you'll do best with the Table of Contents, the Index, and the References. Three Chapters --- Available On-Line! While it's natural to begin by browsing Chapter 1: Starting with Cauchy, let me tell you up-front that this chapter is not typical. It does give some sense of the book's style and method, but, to give everyone a chance to get started, it has to cover some things that many readers may know. Still, it provides a decent quota of less common results that I hope will amuse and inform even the most experienced readers. The chapter also introduces the coaching voice that I try to use throughout the book. Chapter 5: Consequences of Order is more typical, and --- in my view --- much more fun. It's organized around the simplest and most universal ingredient in the theory of inequalities: the ordered list of real numbers. Even after going through the chapter many times I am still surprised that so much useful and subtle information can be extracted from such basic ingredients.. Finally, for an example of a more sophisticated chapter, you might take a look at Chapter 10: Hilbert's Inequality and Compensating Difficulties. While the chapter is ostensibly (and honestly!) about a classic inequality of David Hilbert, it's also about a broader theme --- one that concerns every mathematician. Given a certain result, how can we improve it to give a better result --- one that is sharper, or more general, or which provides some new bit of information? There cannot be any sure-fire recipe, but there are many trustworthy suggestions that have worked well in the past. Part of the fun of writing The Cauchy-Schwarz Master Class came from chasing down the original sources of essentially all of the classical mathematical inequalities. Almost every original paper had some surprise, and some were shocking. In due course, I hope to get these scanned and posted here. For the moment, I'll post two crown jewels of the collection, the 1859 Mémoire of V.V.Bunyakovsky and the 1885 paper of K.H.A. Schwarz. In both cases I had to work with copies provided by interlibrary loan. The copies are readable, but not beautiful. Almost every mathematician (and certainly every Russian mathematician) knows that Bunyakovsky scooped Schwarz in the statement and proof of the integral inequality that is now universally known as Schwarz's inequality. Comparison of their papers goes a long way toward explaining why "Schwarz" became a household name while Bunyakovsky fell into the footnotes. The short version is that Bunyakovsky just took the obvious limit in Cauchy's inequality, but Schwarz made a real breakthrough by proving the inner product version of the inequality that we all know and love. Suppose, for example, that you go to http://gallica.bnf.fr/ark:/12148/bpt6k78986c for Cauchy's "Nouveaux exercices de mathématiques." Clicking on the word "Télécharger" near the top brings you to a page that asks for the starting and ending pages you want, and for the format (pdf or tiff). (The default seems to be first page to last page in pdf format.) Clicking the "OK" button brings you to a page that tells you it's working on assembling the document. When it's done, you'll get the message "Vous pouvez le télécharger en cliquant ici." This last link downloads the assembled document via ftp, so it's a little slow. For this example you get the document N0078986_PDF_1_284.pdf, 128 pages long. In this book of Cauchy's one finds the interesting Article X. Sur la propagation de la lumière dans les milieux où sa vitesse reste la même pour toutes les couleurs, which offers a proof that the speed of light does not depend on the color (i.e. frequency) of the light. Nowdays, this probably sounds "obvious" or "well known" --- but even if it is "known" to you, how would you go about proving it? Perhaps it does come "free" from the d'Alembert solution of the wave equation, but I can't quite decide if this is "cheating". New and so lovely ... a tiling proof of Cauchy's inequality! Roger Nelsen has written a charming piece that provides tiling proofs of many interesting results. To be sure, it covers the Pythagorean chestnuts, but there is also a stunning proof of the case d=2 of Cauchy's inequality. The principle? Well, besides the usual (but nice) principle that "tilings of tilings yield identities," there is the natural observation that a rhombus of given edge lengths has less area than a rectangle with the same edge lengths. Punch line? This "is" Cauchy --- after you see the right rhombus! 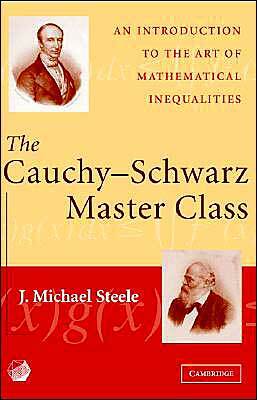 So far this page mainly introduces The Cauchy Schwarz Master Class and gently nudges you toward looking at a copy. Nevertheless, as I get the classic papers posted, I hope that that this page can evolve into one that provides a useful service for our community. Naturally, I have an errata page, and I've also begun a "Further Mathematical Inequalities Problems" page which I expect to grow over time. Please let me know if you find a problem I should add. Finally, if you have a web page that deals with inequalities (or problem solving, or mathematical coaching), please add a link to this page. I'll happily reciprocate. In the era of Google, one lives or dies by links. Also, by learning that someone actually reads these pages, I'll have more incentive to keep scanning and posting more classics. Small Addendum: I made an attempt to get an html version of the references, but the Adobe tool I used is not ready for prime time. Still, I'll post a link just so I won't forget to close this loop. It also shows how lame even the great Adobe can be. More Navigation? (1) Favorite Quotations, (2) Mild Manored Rants, or (3) Surprise Me!